VISALIA – Opioid addiction is an epidemic in the United States. Nearly 100 people die every day from opioids, both prescription and illegal drugs, and drug overdose has surpassed vehicle collisions as the leading cause of unintentional deaths in the country. No one knows the statistics better than Tim Ryan, an ex-con and recovering heroin addict who has attended 110 funerals since finding sobriety in prison three years ago, including his own son. 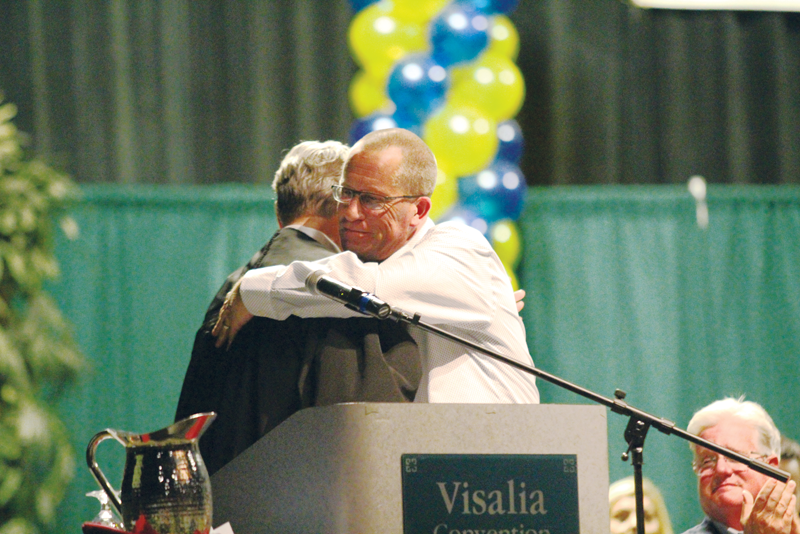 Tim Ryan, the subject of the book “Dope to Hope” and the A&E special “Dope Man,” hugs Tulare County Superior Court and Drug Court Judge Gary Johnson after being introduced at the graduation ceremony on Nov. 29. Photo by Patrick Dillon. 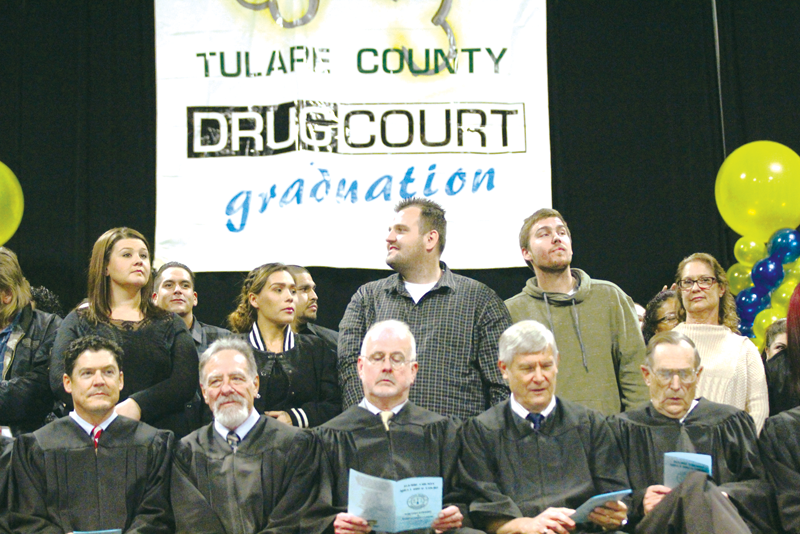 Ryan shared his story of trials, tribulations and triumphs with addiction as the commencement speaker at the Tulare County Drug Court graduation on Nov. 29. There, standing before a crowd of nearly 250 graduates and hundreds more of their friends and family, Ryan talked about his riches to rags to riches story. After becoming a millionaire by his early 20s, Ryan began using marijuana, ecstasy and cocaine before moving on to heroin. Over the next 20 years, he had two heart attacks, overdosed eight times and flat-lined three times and was using $500 of heroin per day. A low point in his life was in December 2010, when Ryan overdosed while driving. He crashed into two other cars and nearly killed four people. It was Ryan’s third DUI, fifth driving on a revoked license and the injuries to the four people resulted in a seven-year prison sentence. Lying in a cell, suffering through withdrawals all with the knowledge that his marriage was over, he had lost his house and that his life was shattered, Ryan knelt for a simple prayer. His prayer was answered when he was transferred to one of only two prisons in the state of Illinois with drug rehabilitation programs. During his 14 months in prison, Ryan said that he read the Bible, addiction literature and began building a business plan to help others find their dreams beyond drugs. After getting out of prison he established A Man In Recovery Foundation, a support and advocacy non-profit for heroin and opiate addicts and their families. “I was the happiest person to walk into that prison, ever!” Ryan said. Tim was released from prison in December 2013. Six months later, his oldest son Nick died of a heroin overdose on Aug. 1, 2014. With 21 months of sobriety already behind him, Ryan was able to turn Nick’s death from a reason to use drugs to escape the pain to a reason to use the pain to help others escape from drugs. “I just wanted to give people hope, the kind that my son never had,” Ryan said. Since the passing of his son three years ago, Ryan has started a successful recovery program, helped more than 3,000 people, from ages 12 to 78, get into recovery programs, been invited to the 2016 State of the Union address, written a book and completed a documentary about his life, his son’s death and their struggles with addiction. He released his book, “Dope to Hope: A Man in Recovery,” in March of this year and then the documentary “Dope Man,” debuted on A&E on July 31, just two days before the three-year anniversary of his son’s death. Executive producer of the hour-long special was Jason Hervey, who played the bully Wayne Arnold in the Wonder Years television show. Ryan is the latest celebrity commencement speaker for the Drug Court Graduation ceremony that includes iconic character actor Danny Trejo and Eagles guitarist Joe Walsh. Ryan said he normally charges $5,000 for speaking engagements, which he deposits into his foundation, but was willing to waive the fee to speak at the Drug Court graduation because the program was unique. “When you have people pay for their own testing and fees then you have buy-in from that person. And then making them be in a 12-step program right out of the gate plus that and they have some real skin the game,” said Ryan, who still attends four Narcotics Anonymous (NA) meetings per week despite a hectic schedule of media interviews and speaking events across the nation. “Stories like Mr. Ryan’s, of people who are famous for turning their lives around, give them motivation and hope that they can do the same,” said Judge Jennifer Shirk, one of two judges that work the Drug Court cases for Tulare County Superior Court. Judge Shirk Tulare County’s Drug Court is also unique because it is well supported by the law enforcement community. All of Tulare County’s judges, Sheriff, local officials and Congressman are represented in the crowd. The structure of the program also sets it apart. Instead of serving their sentence in jail, those convicted of drug crimes have the opportunity to enter Drug Court. The one year program requires they attend AA or NA meetings five nights per week, find a sponsor, appear before the judge handling their case once per week, and attend drug counseling sessions once per week. Every person in the program is required to go to work or school and they work with the Probation Department to help them get their GED and with Employment Connection to place them into job training or positions. On some occasions, the program also works with local dentists to provide free dental services to restore teeth rotted by meth or gums corroded by cocaine. As recovery addicts progress through the program court appearances are dropped to once every other week, and meetings go down to four nights per week. Judge Shirk shared a story of her own. In an interview after the graduation, she said during a sentencing of a new drug case, she had asked a young man convicted of drug crimes if he wanted to serve jail time or attend Drug Court. Compelled to speak up, a former Drug Court graduate was in the courtroom waiting to say hi to the Judge during a break. Instead, the man in the audience asked to approach the bench. Judge Shirk recognized the man and allowed him to stand up a say a few words. He said when he entered the Drug Court program nine different family members had restraining orders against him, including his wife, and that he was not allowed to see his child. Then he held up a set of keys and said that today he was moving into his new house, was living with his wife and their child again, and that every family member had dropped the restraining orders after watching him successfully work his way to sobriety in Drug Court. The young man, who was not sure before, told the judge he wanted to do Drug Court instead of serving time in jail. Similar to the man in the courtroom, Tim Ryan has a second chance at life. Now 49 years old, Ryan is remarried, operating a successful drug treatment foundation, and, most importantly, has a 2-year-old son who has never seen his father use drugs.